We don't have to look far to recognize the truth in Greta Thunberg's words—that we are living in a moment of crisis, and that we need a holistic view of the problems we face before we can address them effectively. Just last week, a groundbreaking study came out that highlights the clear inequities related to how and what we consume. The study, published in the journal PNAS, found that while white Americans consume a far higher share of the goods and services that contribute to air pollution, people of color disproportionately suffer from the effects of this pollution. Polluting facilities of all kinds exist across the country, from coal-fired power plants to factory farms to fracked gas pipelines and compressor stations. The environmental justice movement has long pointed out that these facilities are disproportionately located in communities of color. This new study shows that white people consume a higher share of the “desirable” outputs of these facilities—the energy, food, and other goods that are being produced and the services they support. Meanwhile, Black and Hispanic people disproportionately bear the undesirable outputs: polluted air and unhealthy neighborhoods. The purpose of bringing this up isn’t to assign blame, or to invoke guilt, or even to force us to confront an unpleasant truth. It’s to start a conversation, and to get the neurons spinning. It’s to help us understand that there’s so much we don’t know about how our decisions and actions as consumers affect our communities, and our wider world. Studies like these point to the complexities of the relationships between consumption and broader issues like race and class—relationships that are deeply influenced by the economic and social systems that are embedded in our society and culture. With both consumption and inequality on the rise, it’s clear that we need to question how we’re doing things as a society, and the structures we’ve created that enable issues like these to persist. We’re at a tipping point. We recognize that large swaths of our population—particularly young people and vulnerable communities—have been left out of the conversation on consumption. In many cases, they are more directly impacted by pollution, unhealthy products, and too little consumer choice, and they are often directly blamed for not making better choices, even when choice is not available. As we seek to address the many challenges facing our communities and our planet, it’s clear that countless solutions, of all kinds and at all scales, will be required as we transition to a more just world. But, as a society—and as an organization—we need to shift away from offering prescriptive, “one-size-fits-all” solutions. If we wish to incorporate upstream thinking about systems, we need to better understand the complexities and challenges of consumption, and to weave in new voices. "We need to shift away from offering prescriptive, 'one-size-fits-all' solutions. If we wish to incorporate upstream thinking about systems, we need to better understand the complexities and challenges of consumption, and to weave in new voices." Our core focus will be to center young people in our work, as we consider how to create greater well-being, for more of us. We know that our youth will inherit so many urgent challenges, and that they are under siege in ever more insidious ways by marketers and advertisers. We are eager to learn more about what a “new dream” looks like, through their eyes. We will take our cues from brilliant leaders like our New Dream Youth Fellows—including former Fellow Raag Appadurai, our new Program Lead—and 16-year-old Nobel Peace Prize nominee Greta Thunberg. How will New Dream do this? Education is an important first step. New Dream has always provided our community with information and tools to inform and challenge their everyday practices around consumption and ultimately change social norms. We help people understand how consumption and materialism takes a toll on their well-being and the health of the planet, and we share how to make better consumer decisions. But creating awareness and providing tools for individuals isn’t enough to create the deeper change that we need. Without a better understanding of the problem, it’s hard to know where and how to invest your time and energy. 1. The Question Consumption program supports a deep inquiry into how consumption operates (especially in relation to our economy), what the impacts are across broad populations and sectors, and how they intersect with other issues, like poverty, race, gender, children’s development, and more. This work is a continuation of what New Dream has always done, and makes the connections between larger systemic forces and the impacts of over-consumption on ALL of us. A second important way that we’re helping to deepen understanding (and ultimately to effect change) is by shifting the narrative. 2. 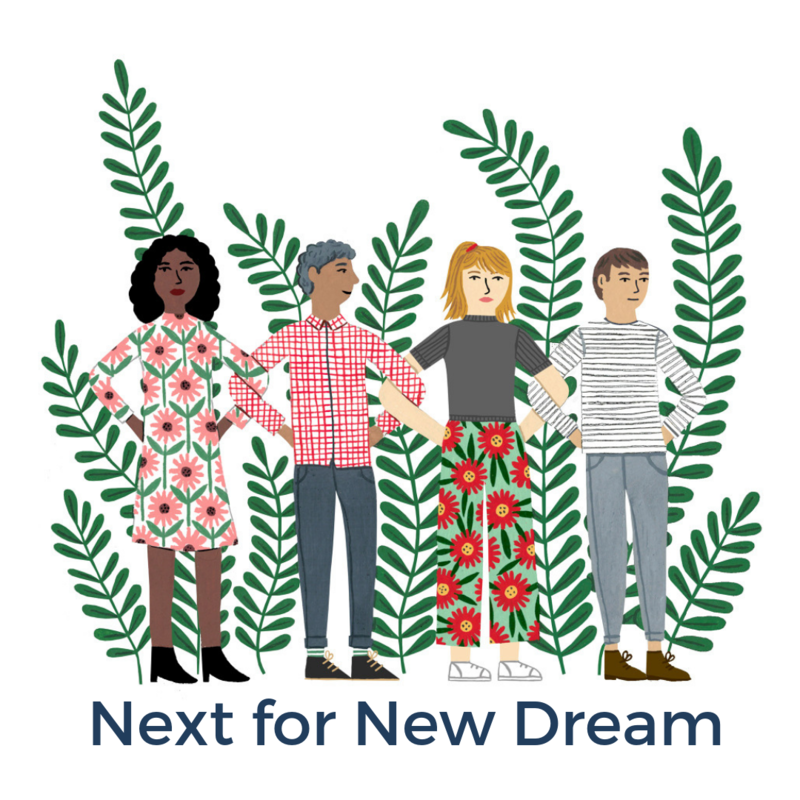 The New Dream Story Project will support shifting the dominant narrative by bringing new and underrepresented voices to the conversation, with the aim of “rewriting the story” about consumption and its impacts. You’ll hear from young people and others — in blog posts, videos, visual art, and a new podcast series — who speak from lived experience about the intersections between consumption and race, gender, religion, and other dimensions of difference. We recognize that we all have a role to play in aligning our own consumption habits towards greater sustainability. And, at the same time, that this is insufficient for addressing the problem without broader systems change. New Dream’s work is grounded in truth, in service of collective well-being. The end goal of our efforts is to bring a fuller understanding of the disproportionate impacts of consumption on different communities, so that we all can determine and take the actions that are needed to truly create greater well-being, for all people and the planet. We are glad to be on this journey with New Dreamers like you. This work is urgent, messy, and required, and we appreciate the efforts and engagement, of each one of you! Contribute to the New Dream Story Project. We compensate young people to contribute their voice, and share their hopes and their work, and will be launching a podcast soon. Share New Dream’s work with at least one friend. Forwarding an email is great, if there is one other person in your community who would want to be involved in our work. Or, encourage them to join our email list. Sign up to participate in our Question Consumption Primer Pilot. We will invite up to 12 New Dreamers to help test our content, beginning in April. Email us at newdream@newdream.org for information. Thank you for all that you have done, and do every day, to improve well-being for people and the planet.